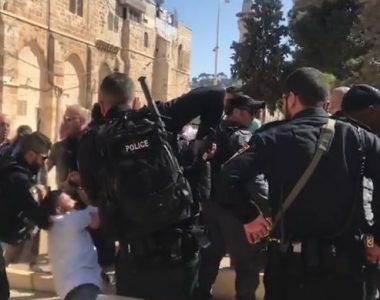 Israeli soldiers abducted, On Thursday evening, seven Palestinian women while trying to enter the Al-Aqsa Mosque, in occupied East Jerusalem, and took them to detention and interrogation centers in the city. Media sources in occupied Jerusalem said the abducted women have been identified as Montaha Amara, Nour Mahameed, Islam Mahameed, Raeda Es’ied and Su’ad Obeydiyya. The women were trying to enter the mosque compound, but hundreds of soldiers and police officers have been deployed in its surroundings, the Old City and many areas, before preventing dozens of Palestinians from entering it. On Friday morning, the army and police pushed more soldiers and officers all over the Old City, and around the Al-Aqsa Mosque, ahead of Friday prayers. Media sources in Jerusalem said the soldiers also abducted at least two guards of the holy site, while more troops, on foot and mounted officers, have been deployed in the area, while the soldiers installed many iron barriers and military roadblocks. They added that the soldiers stopped and searched dozens of Palestinians, and inspected their ID cards, before preventing many of them from entering the holy site. It is worth mentioning that, late on Thursday at night, dozens of illegal colonialist settlers gathered around the Al-Aqsa Mosque, ar-Rahma Graveyard, and Bab al-Asbat, before chanting slogans against the Palestinians while dancing and raising Israeli flags.